This is the land of the Nez Perce and their ancestors. They found a land of plenty where salmon ran in such huge numbers there was never a lack of food. The river itself has three main sections. The Lower Salmon, Main Salmon and the Middle Fork. All are amazing in their own right and have attracted rafters, kayakers, anglers and other outdoor enthusiasts for many years. The lower Salmon River Canyons is one of our favorite stretches to raft. Many know it as the famous River of No Return. With it's huge, white-sand beaches and warm water, we like to call it the Riviera of the West! A neat feature on our raft trips is on the last day. We come to the confluence with the mighty Snake River in Hells Canyon and raft another twenty miles through the tail end of Hells Canyon to our take-out at a place called Heller Bar where the Grande Ronde River joins the Snake. We've been running trips on the Lower Salmon portion since 1982 and welcome you to join us for an adventure on this iconic river that is unlike any other on earth. The scenery on the lower section of the Salmon alternates between dramatic, sheer canyons and huge mountains of golden grass and towering ponderosa pines. This is the American West at its best! The rapids are intermediate, ranging from Class II-IV. Known as "pool and drop" rapids, they are a lot of fun and perfect for paddle rafts and inflatable kayaks. ROW is unique in that we have oar-powered rafts to carry camping gear and food ahead of the group to set up camp and kitchen for your arrival. Of all the sections of the Salmon River, these canyons offer the most idyllic camping conditions and warmest water. There are no mosquitoes and air temperatures are typically between 85-95 degrees during the day and 60-70 at night. From the soft white sand beaches, you can wade into the crystal-clear water, join a game of volleyball, do a little fishing, throw a Frisbee or simply catch some sun. At night we pull out a telescope and gaze into the dark sky, far from the reach of any city lights. Idaho's legendary Middle Fork of the Salmon River is an iconic whitewater rafting trip. Bounce along through more than 100 rapids over the 105-mile stretch of the Salmon River. The free-flowing river drops 3,000 feet through central Idaho's remote and spectacular "River of No Return" wilderness. Natural and untamed, scenic and diverse, it is one of America's first "Wild and Scenic Rivers" protected by Congress. We launch our boats into the Salmon nearly 6,000 feet above sea level and immediately enter an enchanted forest of fir and spruce. The river is steep, shallow and narrow and we careen through boulder-choked rapids. With each passing mile, side creeks tumble into the Middle Fork's clear sparkling water and deepen the flow around our boats. The whitewater rapids are frequent and challenging on this portion of the Salmon River. Guides speak their names with reverence - Velvet Falls, Ram's Horn, the Chutes, Pistol Creek, Devil's Tooth and House Rock to name a few on this Idaho rafting trip. Dropping in elevation, the river widens and the spruce forest opens up to vistas of pine-studded mountains. Rafts drift quietly over deep pools of transparent water—home to native cutthroat and rainbow trout. Guides stop the group often to visit nearby Native American pictographs and pioneer homesteads. Our river guides are intimately familiar with this majestic canyon and use their interpretive knowledge to help draw the silent stories from these historic places. Many of the trips we run on the Salmon River are designed for families and designated as Family Magic rafting trips. 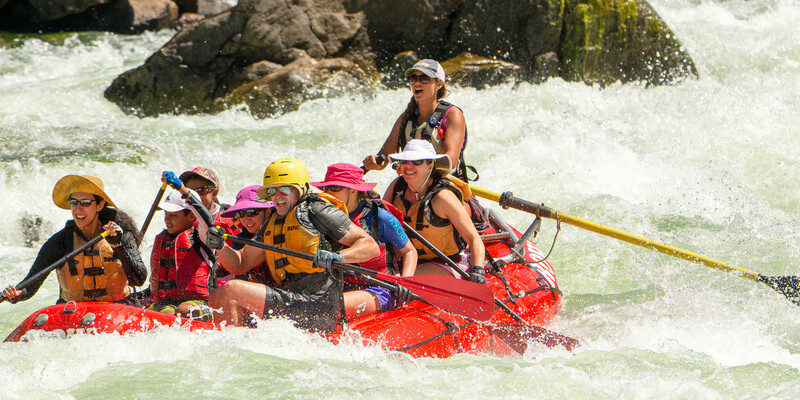 These trips on the Salmon River in Idaho are fun, intermediate white water family trips that blend stunning scenery with hot sun, warm water, great rapids and the most beautiful white sand beaches of any river in the world. 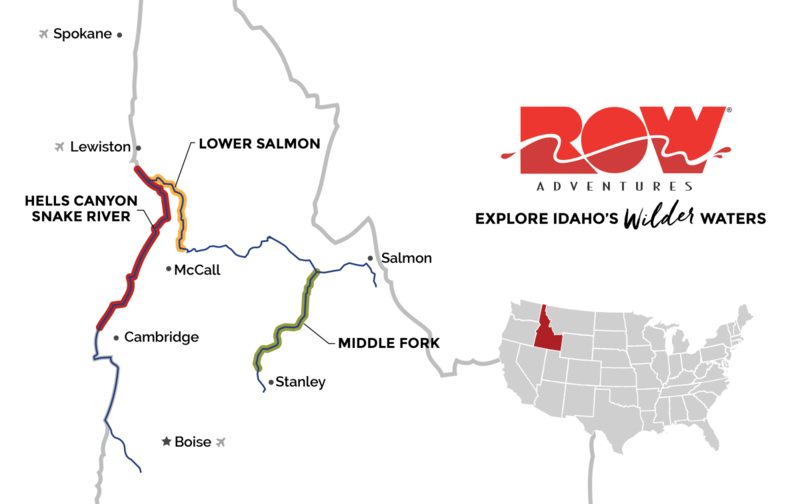 From the put-in spot near Whitebird, Idaho, your family rafting trips float 60 miles of the Salmon River, through twisted volcanic canyons, steep mountains and a seemingly endless western sky. As cliffs and boulders constrict the river, raft-bouncing Class II-IV rapids quench your thirst for white water excitement. Between the rapids we relax, drift and enjoy the mountain vistas. You're likely to spot soaring eagles, and we'll stop occasionally for short hikes to historic sites. Mariah and Jonah Grubb, children of ROW owners Peter Grubb and Betsy Bowen, crawled from cradle to raft at any early age and have been instrumental in teaching us how to run the best family rafting vacations in the world. They insisted that only families be allowed to attend so there are always plenty of similar-aged playmates around. They hired a specially trained River Jester™ who leads fun-filled nature-oriented games and activities along with our family-friendly crew of professional river guides. They helped us create a special kids’ menu that would make Dr. Seuss drool and made sure that the day ends with stories and songs around a glowing campfire. As the river sings its lovely lullaby, you'll comfortably slumber under Idaho's star-studded sky.